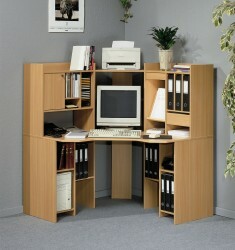 Another good all-in-one furniture item is the corner computer desk as it manages to give its user double the working space. When talking about combining more furniture items into a single one the first idea that springs into many people’s mind is that this will only lead to a more rammed environment where one will need to do a real puzzle to open a drawer. With recent advances in terms of furniture usability and design it is much easier to buy an all-in-one desk which offers the user more functionality in the same package, but which are the upsides and the downsides to acquiring such a desk? To start with, the bed with desk is one of the first options which springs into the reader’s mind as it has the highest level of integration and usability in a single product. The fact that one gets a bed, extra storage and a desk into one acquisition will surely lower down prices as compared to acquiring the items separately, but looking at how the desk and bed are integrated is a good idea before settling for a final buy. The way the desk is integrated within the loft bed with desk is one of the most important aspects. Some options come with a bed on top of the desk, which is a good one if the buyer aims at using the desk as a computer one, but in terms of available lighting it lacks the natural light many need for doing their everyday tasks. Opting instead for a variant which has the desk forming a 90 degree angle with the bed is better as it enables the user to place the desk in front of the window and thus gain a brighter and open working environment. Another good all-in-one furniture item is the corner computer desk as it manages to give its user double the working space. By being well suited for any corner, this type of desk is perfect for people who like to separate their work on the computer from their bureaucratic tasks. Looking at the desk and testing how it feels to work at it is a good tip to follow before making a buy, as some products tend to be a little anti-intuitive. In conclusion, from the furniture items which offer more functionality in a single package the buyer will have to opt for those who best fit his/her needs. Thorough test in the store as well as a full quality inspection should always be performed as not to end up with a product which is not what the user wants.